A motorist works his way down a snow-covered street after more than 7 inches of snow fell in Chicago on Friday. The city is bracing for upwards to 6 more inches before the weather system passes through the area on Sunday. (CNN) - The Midwest braced Saturday for more snow, a day after heavy precipitation and strong winds pounded the region, causing widespread travel delays and more than 1,500 flight cancellations. By Sunday, the Midwest could get 2 to 4 more inches on top of more than a foot of snow that just fell across parts of Illinois, northern Indiana and Michigan, CNN meteorologist Haley Brink said. As the storm pushes toward the Atlantic, winter storm advisories have been posted for upstate New York and New England. The Northeast through Sunday could see 2 to 4 inches of snow, with 5 inches possible elsewhere, especially in Maine, Brink said. Meanwhile, Southern states -- particularly in Alabama, Georgia and Tennessee -- could be at risk of flooding from the warm side of the system, CNN meteorologist Gene Norman said. About 40 million people across the eastern U.S. are under flood watches as heavy rain falls, with some parts of the Southeast due to get 2 to 4 inches. As warnings loomed, the weather's impact was less severe Saturday, with only about 100 flights canceled around midday at Chicago's O'Hare and Midway airports, according to the tracking site FlightAware.com. O'Hare saw 7.8 inches of snow on Friday, while Midway got 8.8 inches. 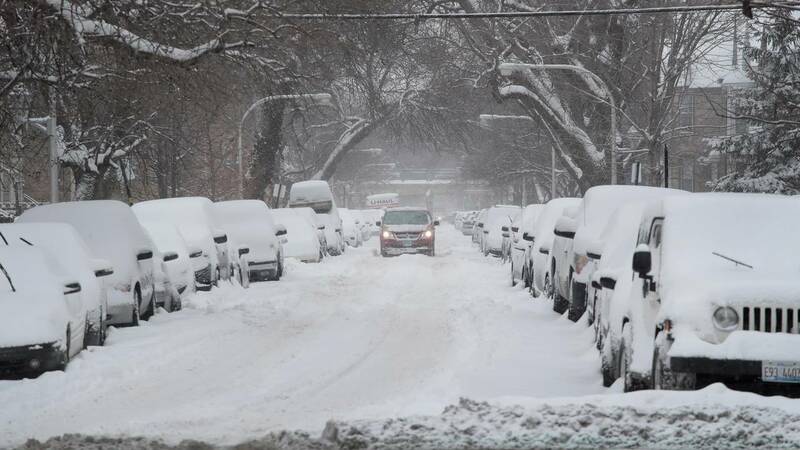 Suburban Plainfield, about 40 miles southwest of Chicago, received 13.5 inches, according to the National Weather Service, while Palos Hills, south of the city, got 16 inches. "We are getting more snow today, tomorrow and Sunday than we have normally gotten in the last two winters in any one period of time," Chicago Mayor Rahm Emanuel said during a Friday morning news conference, adding that the city's top priority was residents' safety. More than 200 municipal snow trucks were out Saturday salting and plowing, according to the city's website. Rachel Linn shared a photo of a tranquil, snow-covered street early Friday. "Road conditions are abysmal," she said, adding she'd take the train. Freddy Travis, who works at an ad agency downtown, shared a picture of the city's Magnificent Mile blanketed in snow while a man shoveled the sidewalk. Travis told CNN via Facebook the snow definitely affected his morning workout. "Honestly," he said, "it was a workout just getting to the gym."